Jay Ronal Wilson, 77, of Clearwater, FL passed away on July 8, 2018, with his loving family at his side. 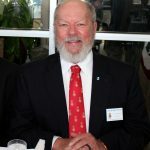 Ron was a valued member of the Sons of the American Revolution and a Past President of the St. Petersburg Chapter, SAR. In lieu of flowers, contributions in his name may be made to Honor Flight. If you knew Compatriot Wilson, please consider leaving a condolence for his family: https://veteransfuneralcare.com/obituary/jay-ronal-wilson. Please take a moment to remember Compatriot Wilson by reading a brief remembrance of his life and work below. He was born in Pittsburgh, PA, the son of John Edgar and Dorothy Wilson and they moved to Livermore, California, when he was five. He graduated from Livermore High School in 1958 and Fresno State University in 1966. Ron enlisted in the U.S. Navy in 1962, entering as an E1 aircraft mechanic and retiring as a Commander (O-5) in 1988. He graduated from Aviation Officer Candidate School and flight training in Pensacola, FL. Upon finishing his flight training, he was awarded his Wings of Gold, his naval aviator wings, in 1970. He was the Distinguished Naval Graduate for his outstanding performance in the flight training program. He also was a flight instructor at Whiting Field in Milton, FL in the Navy’s T-34C and T-38 airplanes. Ron served deployments in both the Mediterranean and the Pacific flew the P-3 Orion 4 engine aircraft. He was the commander of the Naval Facility Midway Island from 1979-1980. He graduated from the Naval War College in Newport, RI in 1979 and the Air War College at Maxwell Air Force Base, Montgomery, AL in 1984. Ron’s last duty station was at MacDill AFB, where he served in J-5, Policy and Planning, at Central Command, retiring as a decorated Commander in 1988. After retiring from the Navy, he was a pilot with ComAir (Delta’s Regional Carrier) for ten years, flying all over the southeast United States and the Caribbean. Ron spent his post-ComAir years building a cabin in Clarington, PA, traveling and enjoying time with his family. CDR. Wilson is survived by his wife, Mary Anne Wilson, daughters Katherine Grundon, Sarah Wilson (Michael Loveless), Alicia LaMont (Marc), Kathryn Asbill (Earl), his brother Doug Wilson (Terri), and cousin Dave Beswarick (Debbie). His eight grandchildren are Jeffrey Peters, Emily Peters, Tommy Grundon, Austin Asbill, C.J. Asbill, Mackenzie Asbill, Zachary Asbill, and Madelyn LaMont. His three great-granddaughters are Haley Peters, Ava Peters, and Yanna Rock.